Just in time for the warm spring days of 2012, Mango Ginger Ale is flying off shelves faster than we ever thought possible! It must be that crisp, delicious flavor taking everyone by storm. First take in fresh mango to your nose, then get a hint of ginger with the first sip. Bright mango washes it down, and finally a ginger pop comes back with hops in the finish. I’m trying to catch up on some late summer and fall beers that I have had in my beer cabinet to review but never seemed to have the time. This one was a summertime favorite; I even had a keg of this for a party we had last summer. However I never got around to reviewing it. Since I have not had this in several months it will be an interesting fresh revisited. The beer pours a clear golden yellow with orange hues and a fairly rich bright white head. The nose is extremely inviting with pale malt aromas with notes of spice and a unique sweetness, I assume from the ginger, it may also be a touch of alcohol. Wow, what a great and refreshing first sip; clean and refreshing with a touch of sweetness on the finish. This brings me back to summer in the back yard. The experience starts out with a touch of pale malt sweetness up front followed by a cleansing effervescence as the ale washes over the tongue in the middle of the sip. The back-end is very easy drinking with an effortless swallow. There is also a slight carbonation release during the swallow that adds a refreshing quality to the experience. The finish is great with clean pale malt flavors followed by a pleasant floral almost earthy hoppiness leading into unique sweetness. The final aftertaste is also unique carrying with it some of that hoppiness and sweetness. There is some subtle complexity here. Not like a Belgian complexity but the hops, mango and alcohol combine for the most unique finish. On a warm summer day the complexity of this beer can easily be overlooked. This is such an easy drinking and refreshing beer you don’t want to put the glass down. As I remember from having a keg of this that 7% can easily catch up on you also. As the beer warms and opens up a bit, releasing some carbonation, it is smoother and even more complex. Now I’m starting to pick up some of that alcohol and a touch of spice. I was at the brewery last summer and helped, well more like watched, Jason brew this beer. I know that there was no spices added. It’s interesting how I’m picking up that note now. There is a definite sweetness on the finish and aftertaste of this beer but if I did not know that mango was added I could not be able to tell you what that sweetness is from; more of the unique subtleties of this ale. The hops are present for sure but are also subtle; especially for an American IPA. To me this is more of a unique twist on a classic English IPA. I’m trying to let this beer warm up but it is very difficult. This is so good and refreshing it’s hard to just sip it. With a little coxing from the palm of my hand I did manage to warm this up to 65 degrees before I took my last sip. At this temperature the beer seemed richer. The pale malt flavors were much more pronounced and the lack of carbonation made the mouthfeel less refreshing but much smoother. The final aftertaste still has the hops and sweetnees but more of the plale malts come through at the warmer temperature. Here’s where I may have to deviate from my review by Style, well at least from Beer Advocates point of view. This is classified as and American IPA by Beer Advocate. I think this is more of an English IPA than American, based on the hop profile along. At any rate this is a solid A+ for me. But it would not fair so well as an American IPA. 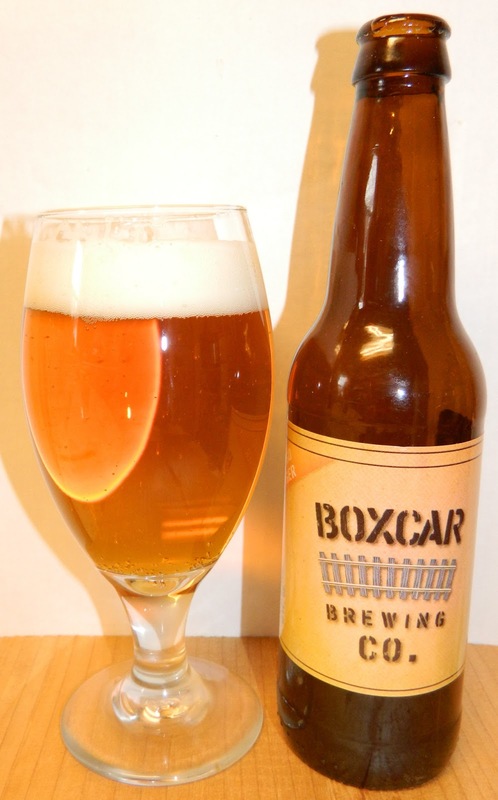 A+ | Boxcar Mango Ginger is a most unique IPA, extremely easy drinking with it’s great pale malt flavors followed by a complex finish of floral hops, clean sweetness and a touch of spice that leaves you refreshed and craving that next sip. Tread lightly; although this drinks like a easy summertime ale it’s 7% ABV can easily catch you by surprise.